Julie Sumner is no quitter. When her husband is killed, she runs their plague-threatened farm alone. All around battle the same danger and wonder at her refusal to grieve, but Julie’s obsessive allegiance to the land and her animals is the only thing that keeps her going. Even when everyone else surrenders, she fights on in a barricade of barbed wire. And when it is men, not bugs, that smash her defences, Julie still isn’t beaten. She uncovers the identity of the man who wiped her out, and she knows where to find him. 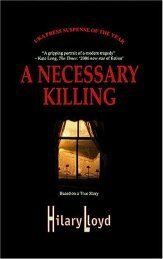 Now her goal is murder, the perfect murder…a necessary killing.